One of the most frequent questions that new turtle hobbyists ask is whether they can put plants in their turtle's habitat. The answer is most certainly yes, they can. But there are benefits and drawbacks to having plants in a turtle tank, and you should think about these before making your decision. For most new turtle hobbyists, I suggest that they wait until they're comfortable caring for their turtles before adding live plants to their turtles' habitats. Adding plants before you're comfortable with your turtle's needs means you have to learn more things at once. There is one exception, however, and that's hornwort, which we'll talk about further down in the page. Hornwort is such an easy and useful plant that I recommend it even for beginners. 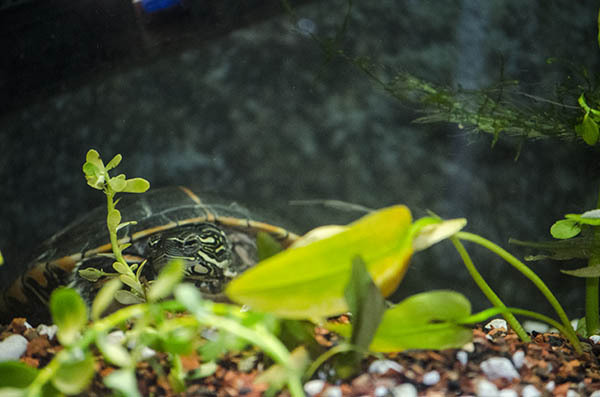 If you already have some experience with aquatic plants (for example, if you take care of a planted fish tank and have managed to keep everything alive), then you may want to consider some more advanced plants for your turtle habitat. 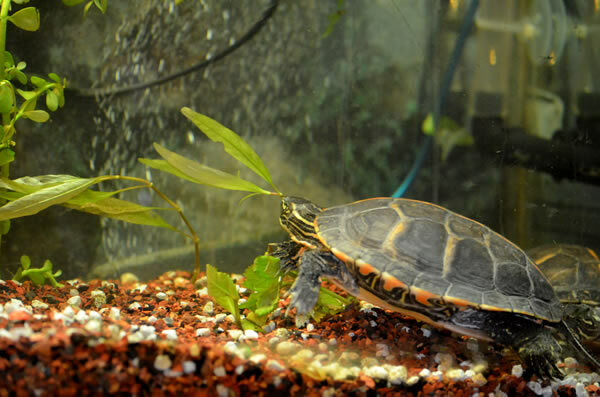 If you're a beginner, let's look at some of the the advantages and disadvantages of keeping live plants in a turtle habitat, and then you can decide what you want to do. 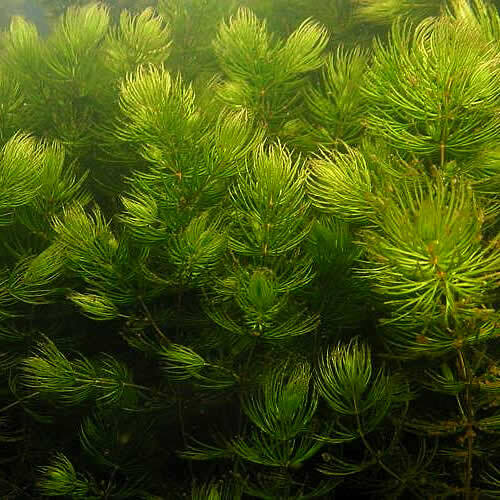 Live plants help filter nitrates and ammonia out of the water, and may help reduce algae by competing for carbon dioxide. Improving water-quality is are the most important benefit of having live plants in a turtle tank. Live plants add visual beauty to the habitat and make it look more natural. Turtles often enjoy exploring and hiding in the plants, as well as munching on them from time to time. A few plant species are toxic to turtles, so don't use plants unless you know what they are and that they are safe. Turtles sometimes decide to make salad out of plants. That will make a real mess in your tank that you will have to clean up. Turtles often dig plants out by the roots for no apparent reason. Maybe they're bored. Like I said earlier, if you're new to the turtle hobby and have no experience with tending aquatic plants, it's probably better that you concentrate on learning to care for your turtle before adding any plants other than hornwort to your habitat. But if you have enough experience with turtle care that you think you're ready to start adding plants, then read on. What Kind of Plants Can I Add to my Turtle Tank? Whether the plant is toxic to turtles. Most aren't, but check anyway. Whether the turtles will find the plants so tasty that they eat them before they even have a chance to grow. How well the plant will do in the relatively warm, relatively low-light underwater environment of a turtle tank. As it turns out, some of the more common, inexpensive aquatic plants available at pet shops make very good plants for turtle habitats because they're not toxic and they grow well in turtle tanks. Here are some good plant choices for beginning turtle hobbyists. Hornwort (Ceratophyllum demursum). 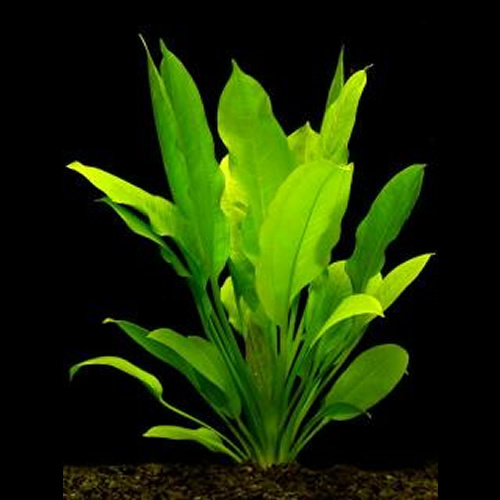 This is my favorite plant for turtle tanks and freshwater aquatic habitats in general. It's also very inexpensive. It does need a lot of light, though, so you'll need a plant light of some sort. Adding hornwort to your turtle habitat is about as simple as can be because it doesn't need a substrate at all. You can tie it to a rock or a suction cup to anchor it to the bottom of the tank, or you can just leave it floating like I usually do. 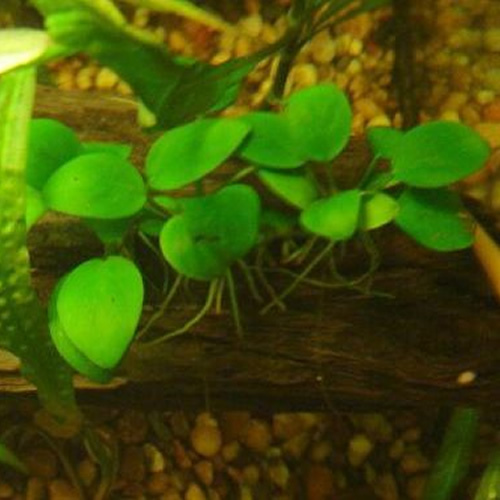 I use it as a floating plant because turtles tend to "rearrange" plants that are rooted or tied to the bottom, so it winds up as a floating plant anyway. Hornwort is the only plant that I always use in a freshwater turtle habitat because it needs no care, is very hardy, and helps keep the water healthy by taking in a lot of nitrates. Better yet, most turtles don't like the taste of it, but if they do eat it, it's harmless to them. It's also the only plant that I recommend that all beginning turtle hobbyists keep in their habitats. It helps keep the water pure and requires literally no care except an aquarium plant light. 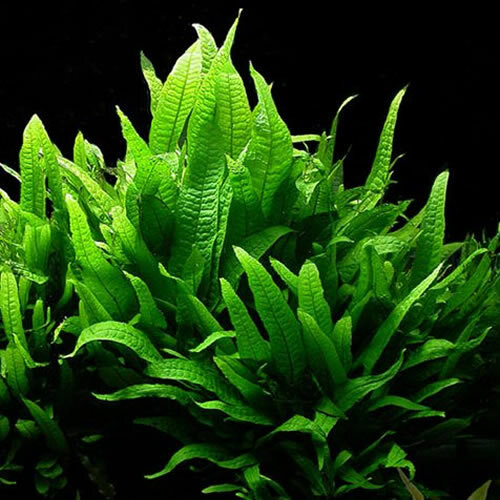 Java Fern (Microsorum pteropus). This common, inexpensive aquarium plant does very well in turtle habitats. In nature, it grows attached to driftwood, rocks, and other submerged objects. It doesn't really have strong roots, so just sticking it in the substrate won't work. It'll just come loose and drift around in the tank. You have to attach it to something. The easiest ways to use Java Fern in a turtle habitat are to wedge it between a couple of rocks or some driftwood; to tie it to a rock or a piece of driftwood with some thread; or to tie it to a suction cup and stick it to the bottom of the tank and pile a bit of substrate around the plant's base. You can use dental floss or string to tie it. Hopefully it will last until the plant attaches itself to the object. Anubias barteri (Anubias barteri, many varieties and subspecies). These are slow-growing, broad leaf plants that are excellent choices for a turtle tank. 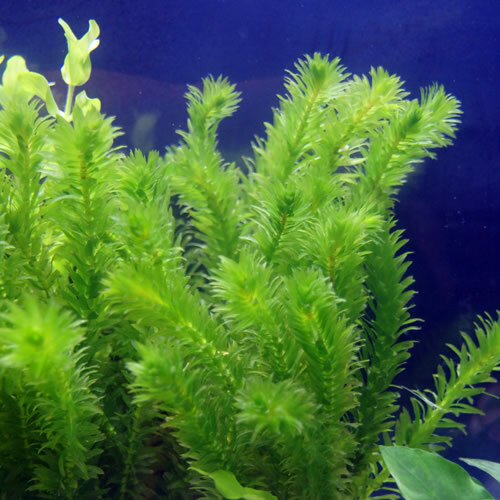 They are one of the easiest aquatic plants to grow and maintain. That's why they're a favorite of beginning aquarists. They're also inexpensive and easily available in pet shops and aquarium supply stores. Anubias plants are about as trouble-free as plants get. They do very well in low-light, don't care very much at all about pH, and must taste really, really bad because fish and turtles leave them alone. The easiest way to plant them is to tie them to a rock to weight them down, and then pile some Fluorite or gravel around the base of the plant. Amazon Sword Plant (Echinodorus amazonicus; many other species). These plants are pretty hardy and easy to maintain, but they do need a decent amount of light. Don't plant them in dark parts of your habitat like underneath the turtle dock. Turtles and fish may nibble at them, but they usually don't eat the whole plant. The turtles are more likely to try to pull them up by the roots. Maybe they're angry that the plants don't taste better! Sword plants have roots and are planted in the substrate. It may help to attach them to a rock at first, however, until they have a chance to grow strong roots. If they're uprooted, you usually can just re-plant them. They're pretty tough. They're also pretty easy to get: Any pet store that sells aquarium plants should have Amazon sword plants. Common Waterweed (Egeria densa), also called Anacharis. I'm not sure whether I should include this plant or not. Lets look at the good and bad things about it. On the good side, E. densa is cheap, only needs moderate light, grows like a weed (which is is), is easy to find at most pet shops, and is fairly nutritious to turtles. On the bad side, many turtles (such as adult Sliders and Painteds) like E. densa a little too much. They pig out on it and make a huge mess. Mud turtles and musk turtles usually leave it alone, though. Very young Sliders and Painted Turtles may also leave it alone because they prefer meat when they're young. One more thing: E. densa is an "invasive weed," which means it takes over other plants' habitat in the wild. In many places it is illegal for that reason. Where it is legal, it should be grown only in indoor habitats and never in outdoor ponds. What's the Best Substrate for a Planted Turtle Tank? This question has a lot of answers depending on who you ask. Some people say sand is best, but I don't like it. It's too hard to keep clean, and it's too dense to allow water to circulate around the plants' roots. It has no nutrient value for the plants, and it can damage your filter if it gets stirred up and sucked into the intake. But some turtles, like softshell turtles, like to dig in sand. A thick layer of fine silica with a shallow layer of water is a good substrate for them. Other people say dirt is best, but I don't like dirt. You have to sterilize it first before you put it in the tank, and it makes the tank water very muddy whenever your turtles dig in it (which they do a lot). You can't use an under gravel filter with dirt, either. Some people say regular aquarium gravel is best, but I don't like it very much. Some aquarium gravel can have sharp edges that could possibly injure your turtles, especially if they eat it (which they sometimes do). It also contains no nutrient value for plants (or turtles), but many aquatic plants seem not to mind very much. My favorite substrate for planted turtle tanks -- in fact, the only substrate I use in planted turtle tanks or any planted aquatic tank -- is a product called Flourite that's made by SeaChem. It's a clay-based gravel that comes in 15-pound bags and is made especially for planted aquatic tanks. Fluorite is made for planted aquariums. It's the best substrate for most plants. Fluorite is non-toxic, stable, and provides a good footing and high nutrient value for rooted plants. It's very pretty stuff, and it really makes the habitat look nice. I usually add some white, rounded medium-sized gravel to it. For whatever reason, I've never seen a turtle eat Fluorite. I guess it tastes really bad. It's an excellent medium for friendly bacteria. There is one annoying thing about using Fluorite: No matter how much you rinse it, the Fluorite dust still turns the water into something that looks like mud (or tomato soup, if you use the red Fluorite) when you add water to the tank for the first time. The dust isn't harmful, but it clogs the filter and seems to annoy the turtles. The label suggests that the Fluorite be rinsed before use, but that doesn't help very much. It still makes mud when you put the water in the tank. So don't plan on introducing your turtles to the tank for at least three days -- and probably longer -- if you use Fluorite. That's why I always add it before I turn on the filter or add the turtles to the tank. After I add the water, I fill the filter with cheap filter floss or poly fill pillow stuffing, and let it run for a day or two to get the dust out of the water. Once the water looks pretty clear I shut off the filter, remove the floss, and put the permanent filter media in the filter. Then I turn the filter, let the water cycle if it hasn't already, and add the turtles once the water chemistry is within limits. I usually don't add plants unless the tank is cycled. Adding the plants can make the cycling take longer because they compete with the friendly bacteria for nutrients. Once the tank is cycled, I add the plants and hope the turtles don't eat them or uproot them. Some turtles like to be landscapers! If tending real plants is too much of a chore, you can try using artificial plants. Most artificial aquarium plants will work fine in most turtle habitats, but the ones that are molded in one piece tend to hold up better than the ones where the leaves are removable from the stalks of the plants. Turtle are much stronger than fish and will pull flimsy plastic plants apart. One thing to be careful about is that turtles often try to "taste" the leaves of plastic plants, and a few turtles never quite figure out that they're not real and will continue trying to eat them. If this happens for more than a few days after placing the plants in the tank, you should remove the plants. Plastic is not good for turtles. It can cause digestive system impaction.